Hey hey! Bjork here, bringing you the news of the century. Okay, maybe not “of the century.” But definitely of these next few days. Are you a content creator always looking for the “next big thing” to help your content stand out? Do you wish you could make recipe videos like the ones you see on social media and here on Pinch of Yum? Or maybe you’re looking for a way to refine your video-making process to really help your videos stand out? If you answered “yes!” to these questions, you are in luck, my friend. Food Blogger Pro is holding an awesome free event this Tuesday, November 6, and you’re invited. 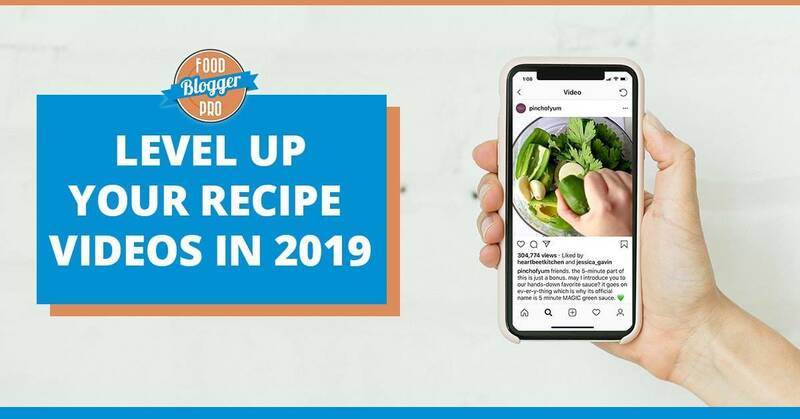 It’s called the Video in 2019 Summit, and it’s where you’ll learn how to improve your recipe videos in the new year! Let’s play a game: guess how many video views Pinch of Yum recipe videos have gotten on Facebook in the past year and a half. Much, much higher. 41.8 million. That’s 41.8 million extra times that our content was seen over just producing recipes and blog posts alone. That’s pretty incredible, right? And super telling of the current climate of the content creator space. Videos are part of our social strategies, our sponsored content contracts, our blog posts, and so much more. And if you’re ready to start making or fine-tune videos for your own brand, the Video in 2019 Summit is for you. Camera, tripods, and monitors…oh my! Our wonderful Video Specialist, Emily, will be chatting all about the tools and gear she uses to produce the recipe videos you see on Pinch of Yum. There’s *a lot* that goes into the final videos that end up on the blog or on our social channels, and Emily will unpack all of that information for you. She’ll even give you tips on the best set-up for shooting multiple angles to keep your videos lookin’ fancy. This is where we’ll go into the nitty-gritty stuff. We’ll be focusing this session on the techniques, tips, and tricks that really make our videos pop and help to engage our followers. Emily, Jenna (our Communications Manager), and I will be talking about the importance of hooks, storyboarding, making animated doodles, working with sponsors, and so much more. These 10 pointers will help your videos stand out and turn you into a video-making machine! We’ll talk through *a lot* during the first two sessions of the summit, so you’re bound to have some questions. *This* is where we’ll answer them…live! Emily and I will tag-team this Q&A session to chat through all the difficult or confusing aspects of video-making, and we’ll get all of the questions for this session from y-o-u. Pro tip! If you can’t attend the sessions live, a replay of the sessions will be available until the evening of Wednesday, November 7. Then they’ll be uploaded to Food Blogger Pro as a course for our members. The post Save the Date: Our Video in 2019 Summit! appeared first on Pinch of Yum.